There is NO Word of God; ONLY the Words of Men. It‘s that simple. Get over it. Now go in peace and get on with your life. For example, being “authorities” on the word of God, if one of them got sick as the result of eating not fully cooked pork, why then they declared that God forbids the eating of pork! If one of them had an allergic reaction to seafood, then God bans it! And if one really wanted to make a baby boy suffer in order to test a parent's loyalty . . . why, these were the words of God to us. They kept piling up the ”words.” Get it? There is NO Word of God; ONLY the Words of Men. It‘s that simple. Get over it. 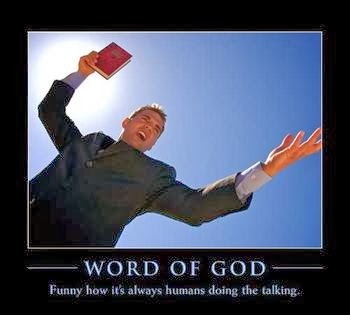 Now go in peace and get on with your life.You can bet your last dollar that when someone uses the “word of God” as justification for actions or as commands you must follow for your moral compass, you're being set up for exploitation by that person. It's traditional, it‘s from the beginning and ever shall be. And being god-words of men, their meanings can be twisted, morphed, interpreted, and searched through as if they were true. The great hoax lies in asserting that they are true beyond all known truth and inquiry; those words of men. Carl Sagan once said that extraordinary claims require extraordinary evidence. Religions deny this, which should be a huge red flag violently waving to warn humankind. (One difference between a believer and this non-believer is basically, “You trust your clergyman and I don’t.” Note to clergy: Fool me once, shame on you. Fool me twice, shame on me.) So where is the extraordinary proof for those extraordinary claims? Let‘s consider just some of the evidence that the most extraordinary scriptural claims are false to begin with: No “in the beginning” witnesses. There is absolutely no evidence of a great drowning of all animal and vegetable life on Earth. Egypt has no records of Israelites as slaves there, nor of a Moses dwelling there. There was no Roman census at the time when “Jesus” was born. No historians wrote of the Jesus of the gospels and his wondrous miracles, death, alleged rising from the dead, etc... all extraordinary claims! These were all fabricated decades after his alleged existence ended. And yet those writings are proclaimed the “word of God,” before which every knee shall bend, which every government in the West shall honor! Quite a con job, that. Do you have any idea how many millions have already needlessly suffered and died because made-up nonsense of ignorant, clever manipulators has been taken seriously? Do you have any idea of how much money has been made by “experts on the Word of God” telling people what the purposes of their lives are? Or by those telling them they were created for a purpose in the ﬁrst place, and that purpose is to live according to the “living words of God?” (Those words dependent on birthplace and/or which denomination’s version got to the natives first.) The bottom line is that the words of men spoken as the authoritative words of a god are used as the ultimate no- questions -asked authority! And the message underlying these words is: humankind is basically evil, so humankind needs to be controlled using the word of God as absolute authority. What an attitude those writers had! And what a con job on those who don't question them. But swear allegiance to those words? No; rather, reveal that the emperor has no clothes. Note: Another school shooting, in New Mexico. CNN news broadcast a tape of a congregation praying in church shortly after. That scene didn’t stay on very long, but I noticed at least one member with an uplifted arm. We've seen whole congregations, hundreds of believers, with raised arms, praying and praising. It wasn’t until tonight that I asked myself what was so familiar about this, the “Where have I seen this before?” Of course, in films of the Nuremberg Nazi rallies! Come to think of it, both Mussolini and Hitler required that very same salute. Don’t these participants realize they are imitating the sign of subservience to a dictator?